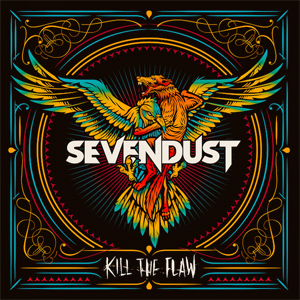 SEVENDUST’s new studio album, Kill The Flaw, is slated for release on October 2nd via 7Bros. Records with ADA/Warner Brothers Distribution. In advance of the release the band is now streaming the album in full and you can check it out below. The album opener and first single “Thank You” shows that SEVENDUST is back and better than ever. The song can be heard below. Tracks like “Death Dance”, “Cease And Desist” and “Not Today” exemplify the growth of the band as songwriters. Throughout the album, the musical development flourishes while never losing the signature sound that has garnered the band fans worldwide. Kill The Flaw is available for digital pre-order at iTunes. Fans who order the album will receive an instant download of the first single, “Thank You”. The physical CD is available for pre-order in various bundles via Sevendust.com. SEVENDUST are direct support on the current GODSMACK tour which kicked off on September 23rd in Detroit, MI and runs throughout October where it wraps on October 19th in Ottawa, ON. The tour will be making stops in Kansas City, Huntsville and Poughkeepsie to name a few. Find the band’s tour schedule on Facebook right HERE.